This album never got the publicity that some of the other Jon and Vangelis discs did. That’s really a shame because in many ways it’s the most diverse of the releases. For my money it might not be the best, but it’s darned good and deserved a better shake that it got in terms of getting the word out. The cut starts with delicate keys and Anderson’s voice comes over. After a time this becomes a more rocking arrangement and the cut grows as it gets more complex and involved. There’s a cool jazzy jam later in the number. It is quite a strong piece of music and includes many layers of vocals from Anderson. The title track is short and includes some music that feels like it would fit into the Anderson Bruford Wakeman and Howe project quite nicely. This is gentle, balladic and very pretty. They bring a jazz-oriented section to the table later in the powered up section and this is a great tune. This is neither the Pink Floyd song nor the song by the same title on Yes’ box set. 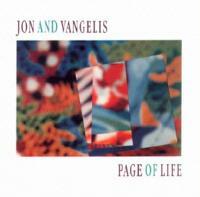 Instead it’s a killer rocker that’s all Jon and Vangelis. It’s fast paced and one of the highlights of the set. The jazzy elements are really on this, but it feels a lot like something from Frank Zappa. It has a lot of RIO in the midst, too and works through a number of unusual variants. This is actually an instrumental. This melodic number is more in keeping with the type of sound I usually think of when I hear the name “Jon and Vangelis.” There are also some musical links to the jazzy era of Pink Floyd. Very pretty and powerful, this is a track that grows in magical ways. It’s packed with emotion, not just lyrically, but also musically. It starts fairly sedate and builds into a soaring composition. Here we get an angelic song that in one way could be seen as a love song. If you dig deeper, though, it seems more like a spiritual anthem. It’s pretty and powerful. A good chunk of this track is just Jon Anderson’s voice accompanied by percussion. After a while, though, they power out into a serious rocker. There’s a real groove to this. T gets quite seriously rocking as it carries on and really is something that feels like it could have been done (a bit differently, of course) by Yes. More classical in nature and tone, this is closer to some of the music from the earlier Jon and Vangelis CD’s. It’s powerful and quite symphonic in style. There’s a gentle and playful nature to this. It’s another that feels like it would have been at home on one of the earlier discs from this duo. It’s mellow and quite pretty, but it does get fairly intricate and involved at times. This cut is also something that I could have heard appearing on one of the earlier J and V discs. It’s lovely and delicate. It does turn more bombastic and symphonic later, though. As the title suggests, this is a short “little” guitar solo.